Misery Index: Another One Bites The Dust..... Good Bye WaMu. Washington Mutual - the second-largest savings and loan institution in the US, - had suffered losses of 80 percent of their value since the beginning of the year, going from a 52-week high of $36.47 to a low of $1.69. WaMu had offered "option" adjustable-rate mortgage (ARM) loans. As the numbers of holders of WaMu's ARM loans in default began increasing in 2007 and 2008, losses had ballooned. For its second quarter 2008, WaMu reported a $3 billion loss. For weeks, the Federal Reserve and the Treasury Department were nervous abut the fate of WaMu, among the worst-hit by the housing crisis, and pressed hard for the bank to sell itself. WaMu publicly insisted that it could remain independent, but the giant thrift had quietly hired Goldman Sachs about two weeks ago to identify potential bidders. But nobody could make the numbers work and several deadlines passed without anyone submitting a bid. In March, 2008, on the same weekend that Dimon of JPMorgan Chase negotiated his daring takeover of Bear Stearns, he secretly dispatched members of his team to Seattle to meet with WaMu executives. When JPMorgan Chase offered WaMu $8 a shore, largely in stock, the prior CEO, Killinger, balked at the deal and rejected it. If the JPMorgan deal had gone through, WaMu's shareholders would have wound up with a stock in a very strong financial institution. Instead, a month later, WaMu execs choose a different company. WaMu sold Texas Pacific Group 176 million shares at $8.75 each - 26 percent below the stock's price the day of the deal; it also sold almost 20,000 preferred shares that can be converted into WaMu common stock at $8.75 each. WaMu issued five-year warrants to the investors, allowing them to acquire 68.2 million shares of WaMu stock at $10.06 each. The total shares issued to the TPG group, including those covered by the warrants and preferred stock, represented 50.2 percent of the company's shares out. Under New York Stock Exchange rules, any issuance of stock that increases shares by more than 20 percent requires approval from existing shareholders. But some WaMu shareholders call the vote a joke, saying that the deal was front-loaded with financial penalties that essentially forced them to approve it. For example, if the transaction was not approved by June 30, WaMu would have had to pay a special dividend with an annual interest rate of 14 percent to the TPG investors. If shareholders would not have approved the deal by March, 2009, more dividends would be paid at a rate of 15.5 percent. By September 2009, the penalty rose to 17 percent. And if shareholders would have rejected the deal, the price at which the warrants could be converted into common stock would decline every six months by 50 cents each, with a maximum drop of $2 a warrant. That makes the warrants far more valuable to TPG and its friends, and a lot costlier to WaMu shareholders. The deal was approved, and WaMu's shares continued to fall. Shareholders wondered why their company's board and management didn't negotiate better terms or allow existing shareholders to buy additional equity at a discount. They asked why the deal was constructed to force shareholders to approve. Steve Abrecht, executive director of the S.E.I.U. Master Trust, a group of pension funds benefiting members of the Service Employees International Union; the trust owns WaMu shares. "We feel that the board and the senior executives seem to have gone quickly to an option that preserved their positions instead of looking out for long-term shareholders." Shareholders unhappy with the performance of the management and the board of directors pushed for changes to both. At an annual shareholders meeting in April, some called for Killinger's resignation and they voted to split the jobs of chairman and chief executive, both of which Kerry K. Killinger held. While the vote was advisory, the company did separate the titles. Kerry K. Killinger, chairman and chief executive of WaMu, was stripped of his chairmanship. Stephen Franks was named chairman. According to WaMu, Frank replacing Killinger as chairman resulted from "listening to feedback from our shareholders." WaMu also made some additional moves, including: appointing Orin Smith, former Starbucks Corp. CEO as chairman of the finance committee; appointing Dallas Mayor Thomas Leppert to serve as chairman of the governance committee and appointing Regina Montoya as chair of the corporate relations committee. WaMu announces that it had decided to stop offering two complex mortgages, including option ARMs. WaMu had rode negative amortization loans to mortgage market prominence during the recent housing boom. However, now they were discontinuing all negative amortizing loan product options, in an effort to refocus its lending operations on more traditional mortgage products. The banks portfolio included some $57 billion in option ARM mortgages. WaMu announced James Corcoran, the president of its retail banking division, was being replaced with Stephen Rotella on an interim basis until a permanent successor is selected. WaMu reported a $3 billion second-quarter loss - the biggest loss in its history - as it increased its loss reserves to more than $8 billion to cover bad loans. During that second quarter, WaMu announced plans to exit the wholesale lending business and close all remaining standalone home loan center, resulting in 3,000 job losses. The bank said it would instead focus its mortgage-originating efforts in its retail bank branches and Web site, and by expanding its call center operations. WaMu announced an additional 1,200 job cuts in June bringing layoffs since December 2007 to more than 7,300. There were also rumors that WaMu would be doing additional layoffs in September 2008. On July 11, 2008 it was reported by the Puget Sound Business Journal (Seattle) that at the same time WaMu was laying off some employees, it was also trying to keep others offering retention bonuses to prevent some workers from jumping ship during its very public downturn. WaMu did confirm that it is giving bonuses however, it declined to provide details about the amounts or how many employees have received them, saying it doesn't comment on employee compensation. "On occasion, retention bonuses are provided on top of regular compensation to keep a critical employee engaged through a specified period of time," WaMu said in a statement. It added that the bonuses are given "if an employee's function/business are shutting down or changing significantly and the employee is needed through the transition period." Kerry K. Killinger was ousted as chief executive of WaMu by the board of directors. Killinger had joined WaMu in 1982 when it acquired the brokerage firm Murphey Favre. by 1988 he had risen to the job of president, and added the CEO's title in 1990, then named chairman in 1991. Killinger departed the company under the terms of his contract, with no extra severance payment. Killinger's annual pay had been estimated by various news sources at about $15 million. "The board and Kerry mutually agreed that this was the right time for Kerry to leave the company," said spokesman Brad Russell in an e-mail to The Associated Press. Alan Fishman was named his successor. Fishman was to be paid a bonus of $10 million, including a $2.5 million performance-based stock award, in addition to a $1 million base salary, and a $7.5 million sign-on bonus. There was also an annual bonus of 365 percent of his base salary, or of $3.65 million. The total salary and incentive package was worth more than $20 million through 2009. "The board has great confidence in Alan's ability to lead WaMu and to return the company to profitability as quickly as possible," Chairman Stephen E. Frank said in a conference call with analysts on Sept. 8. WaMu however, declined to comment on the pay package. If Fishman stayed for the full year, he would receive a long-term incentive award of no less than $8 million, according to the SEC filing. Fishman would also receive options to purchase 5 million shares of the company and 612,500 restricted shares, which would vest at an annual rate of 33.3 percent over three years. The options would have a term of seven years and would vest on his service and company performance, although a quarter of those shares, or 1.25 million, would vest after one year regardless of performance. If Fishman is fired or resigns as a result of "constructive termination" he would receive a golden parachute within 10 days, worth 2.5 times his current base salary and his annual bonus of the preceding year. In an interview with the AP, Fishman said his first three priorities are to review the balance sheet, review the income statement and review the brand. He said it is too early to comment on whether the bank will pursue any asset sales. At this time, WaMu had lost nearly 70 percent of its market value since the start of the year. It had reported a $3 billion second-quarter-loss -- the biggest in its history -- as it boosted its reserves to more than $8 billion to cover losses. Credit ratings agency Standard & Poor's lowered its outlook on WaMu to "Negative" from "Stable". Standard & Poor cut WaMu's credit rating to junk. This caused WaMu's stock to tumble, again, as Lehman filed for bankruptcy and Merrill Lynch & Co. agreed to sell itself to Bank of America Corp. for $50 billion. S&P acknowledged that WaMu's deposit base is stable, saying in its statement about the downgrade yesterday that the company has enough liquidity to meet all fixed obligations through 2010. "The bank is operating with adequate capital positions from a regulatory perspective and has demonstrated funding resilience as the deposit franchise has remained stable," S&P said. Meanwhile, Bank of America's CEO Ken Lewis, dismissed any prospect that his bank is interested in acquiring WaMu during an interview with CNBC Monday, following the bank's press conference announcing its deal to purchase Merrill Lynch & Co.
WaMu responds to S&P's rating by saying that the "junk" is based on market conditions overall, not specifically on the bank's financial condition. "It's important to note that S&P attributed its action to worsening market conditions, and not to any material change in the evaluation of Washington Mutual's financial condition," WaMu officials said in a statement. The company added that it has minimal trading exposure to Lehman Brothers Holdings, which declared Chapter 11 bankruptcy over the weekend, and no trading exposure to beleaguered insurance company AIG. Various banks are saying they've seen an increase in customers pulling their money out of WaMu and bringing it to their institutions. President Steve Rotella pleaded with employees not to join the "rumor cycle" and instead "get back to work." In a message posted on the company's internal Web site and obtained by the Puget Sound Business Journal, Rotella acknowledged that "this is an incredibly difficult time for everyone here at WaMu. Beyond that, what is occurring in our industry and the broad global economy is unprecedented." "Hard as it is, it seems to me that we all have a choice - join the rumor cycle, speculate and buy into a cycle that is just creating more concerns or get back to work and focus on doing all we can for our customers, which is all we can do for the company, ourselves and our colleagues. "My request is, let's take the latter path and control what we can control and don't succumb to the former." He ended the letter with a thank you and instructed employees to "look for an update later today." CEO Alan Fishman, released a letter to be handed out to customers with concerns. The letter piggy-backs the letter written by Steve Rotella to customers earlier this week that also addresses anxious customers. Fishman, who has been largely silent since he was brought on a week ago, wrote in his page-long letter: "When I was recently approached about the opportunity to lead this great company, I did my homework to satisfy myself that WaMu has the capital, the liquidity and the business plan to serve your needs and protect your money through these challenging times." Fishman went on to say: "I came to WaMu because I think it is a great bank with a strong franchise and a solid financial position. We take very seriously our role as the stewards of your hard-earned money." WaMu had been making a big push over the past week to reassure customers, some of whom - according to one branch employee - have been withdrawing money from the bank in the Seattle area because of concerns about its safety. Standard & Poor's downgraded WaMu's debt further into junk territory, cutting WaMu's credit rating again, citing the increased chance that the company might have to be split up to facilitate a sale. The rating was made "due to the increased likelihood that a potential sale of the company may not involve the whole company, which increases the risk of default for holding company creditors," according to S&P. WaMu insisted that it is well-capitalized and has adequate access to funding and noted in a written response, its deposit rating from S&P continued to be investment grade "and it is important to note that Standard & Poor's rating actions do not affect the safety of customer deposits, which are insured up to the limits allowed by the FDIC." The government went behind WaMu's back to work privately with four potential bidders on a deal. On Wednesday afternoon, the government solicited formal written bids. On Thursday morning it was reported that WaMu had approached several private-equity firms abut a potential takeover, according to a published report Thursday. Carlyle Group LLC and Blackstone Group LP are among the firms considering a deal, the Wall Street Journal reported, citing unnamed sources. The Wall Street Journal also reported that banks such as JPMorgan had diminished in recent days over reluctance to absorb problem loans on WaMu's books, citing again unnamed sources. Also that morning, regulators notified James Dimon, chairman and chief executive of JPMorgan Chase, that he was the likely winner. "We are building a company," Mr. Dimon said in a brief interview. "We are kind of lucky to have this opportunity to do this. We always had our eye on it." Without depositors knowing it, the federal government seized Washington Mutual or WaMu, Thursday night calling the bank, in its words, unsafe and unsound. 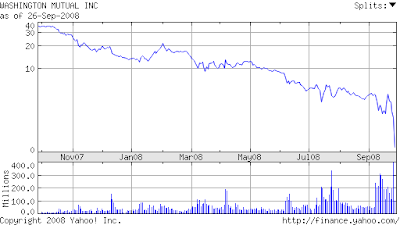 Since September 15, 2007 WaMu customers had withdrawn $16.7 billion. Regulators simultaneously brokered an emergency sale of virtually all of WaMu to JPMorgan Chase for $1.9 billion. JP Morgan Chase them bought WaMu's deposits and branches stating JPMorgan saw "no price" at which it would have made a bid for the entire bank. The seizure and the deal with JPMorgan came as a shock to WaMu's board, which was kept completely in the dark: the company's CEO, Alan H. Fishman, was in midair, flying from New York to Seattle at the time the deal was finally brokered, according to people briefed on the situation. Against all odds, WaMu shares continued to trade Friday. That's because, while JPMorgan bought the company's baking subsidiary, it left behind the parent holding company - a shell containing little more than a passel of nonbanking subsidiaries. The shares fell to 16 cents as 102 million changed hands Friday. Among stockholders hit by WaMu's demise is the Washington State Investment Board, which said the collapse will cost pension and other types of funds it manages about $47 million, or 0.06 percent of its $78 billion in total assets under management. JPMorgan was only one of five potential acquirers. Citigroup, Inc. elected not to bid for WaMu because presumed loan losses outweighed benefits from the deposits, said a person familiar with the situation. Wells Fargo & Co., Banco Santander SA and Toronto-Dominion bank had expressed interest in buying all or parts of WaMu, said a person with knowledge of the process. So JPMorgan for a mere $1.9 billion purchased WaMu's deposits and branches. In a statement, JPMorgan Chase said it was not acquiring any senior unsecured debt, subordinated debt, and preferred stock of WaMu banks, or any assets or liabilities of the holding company, Washington Mutual, Inc. JPMorgan Chase's chief executive, Jamie Dimon, said in a conference call, said the "only negative" related to the deal was "how to handle some of these bad assets." He did not elaborate. JPMorgan also assumed the obligation to pay pension benefits to WaMu's retirees, said Andrew Gray, a spokesman for the FDIC. WaMu listed about 6,900 retirees on a 2006 IRS reporting form. JPMorgan spokesman Kelly said Friday the bank is looking at all of WaMu's benefit plans, and declined to say if the bank would pay the benefits. He called the issued a "very detailed question." According to regulatory filings, only a fraction of the pension plan was funded with WaMu stock. JPMorgan also assumed WaMu's 401(k) plans for current employees, said the FDIC's Gray. Another bank bites the dust to the fallout of the subprime mortgage crisis, with about $307 - $310 billion in assets and about $188 billion in deposits. This Thursday takeover was a unusual act on the behalf of the government, as seizures usually occur on Fridays to minimize disruptions. The U.S. Government "needed to find a buyer for [Washington Mutual] because a takeover by the Federal Deposit Insurance Corporation would have dealt a crushing blow to the Government's deposit insurance fund," The New York Times reported on Thursday. The FDIC reserves had already been hit by the failure of IndyMac, with its reserves totaling around $45.2 billion, down from $52.4 billion at the end of 2007. By doing this action, this averts another potentially huge taxpayer bill for the rescue of a failing institution. WaMu offered was is called Adjustable Rate Mortgages, or ARMs. These ARMs offered lower rates during an initial fixed rate period, an initial fixed rate period of up to 10 years, and rate adjustments annually after the initial fixed period. ARMs generally permit borrowers to lower their initial payments if they are willing to assume the risk of interest rate changes. These ARMs are typically, but not always, less expensive than fixed-rate mortgages. These ARMs were very, VERY popular during the housing boom a few years ago. The only problem is that if the interest rate rises (which they have), then some consumers can not repay the loan, and thus the home is foreclosed. If the bank can not sell the property quickly, and have many foreclosed homes, then the banks income drops, which is what happened to WaMu, among other things. Additionally, WaMu pushed at the height of the housing boom into riskier loans to less creditworthy buyers. Option ARMs let borrowers skip part of their payment and add that sum to the principal, so that when the housing prices fell, as they have since 2006, they might end up owing more than the residence is worth. If a bank were to offer large volumes of mortgages at adjustable rates (which WaMu did), but to derive most of its funding from deposits (which WaMu did), the bank would have an asset-liability mismatch: in this case, it would be running the risk that the interest income from its mortgage portfolio would be less than it needed to pay its depositors. This is what happened to WaMu in the beginning, in addition to increased foreclosure on houses, and no one buying the homes. All of this combined with S&Ps rating on WaMu to "junk" collapsed WaMu's credit rating, the stock price tumbled, and WaMu had no options for money other than to sell. Facing $19 billion of losses on soured mortgage loans, the lender put itself up for sale last week. But no one wanted them with their high liabilities, as there wasn't a picture of profit to be made, at least not anytime soon. WaMu's ultimate demise happened fairly quickly when nervous depositors started pulling their cash out of WaMu in waves. Since September 15th, customers withdrew $16.7 billion from their WaMu accounts in a "Bank Run". It was a downward spiral, federal regulators say they had to stop it. As for WaMu shareholders, there is a good chance they could be wiped out. Bondholders are likely to lose most of their money after the seizure. TPG took a minority stake of $1.35 billion in WaMu in May, 2007, an infusion that has now been wiped out by the takeover of WaMu. TPG lost its entire $1.35 billion investment in WaMu. David Bonderman, billionaire investor, didn't even know it was happening. Late Thursday evening, he got word of the bank's government takeover and selloff via headlines over Down Jones Newswires. TPG's investment in WaMu had temporarily relieved some of the pressure by allowing the thrift to raise more capital, thus making it more attractive to any potential buyers. But the private equity firm's stake also diluted TPG's own holdings, a problem the firms say is relatively small compared to its other assets. "While this loss is extremely disappointing, we are well diversified across platforms, geographies and sectors, and this investment represented a very small portion of our assets," said the statement from TPG. JPMorgan said today it sold $10 billion offering of approximately 246.9 million shares of its common stock at $40.50 apiece to raise capital. JPMorgan used its own investment bank to value the mortgages, he said. Underwriter J.P. Morgan Securities Inc. has a 30-day option to purchase approximately up to an additional 37 million shares to cover over-allotments. JPMorgan stated it had 75 people involved in the transaction and "bid to win" because it wanted WaMu's assets, Dimon said on a conference call yesterday (Thursday). David Franklin, a health insurance agent in Los Angeles, knows his money is protected and that it's being transferred to JPMorgan. Still, he was closing a $30,000 joint account today with his wife at WaMu and planning to transfer it to Wells Fargo & Co., where he has other deposits. "It's the element of the unknown," said Franklin, 33, while standing in line at a WaMu branch in Beverly Hills. "I'd just rather be safe than sorry." "JPMorgan Chase has 8.1 trillion dollars in credit derivatives - the largest of any bank in the international financial system. (Office of the Comptroller of the Currency). That means Morgan is in far more trouble than the banks it is "saving" and buying. Unless you do it with more 'innovative accounting' that swindled us into this mess in the first place. Morgan is going to fall too." - Laresstt of NE. "One former WaMu employee in Boston, who said he was laid off late last year, wondered Friday what will happen to about $650,000 he was to receive in deferred salary, which employees utilize for tax benefits. The former employee, who asked that his name not be used, said he feared he was going to be "wiped out." David Barr, an FDIC spokesman in Washington, D.C., said deferred compensation usually is treated as an unsecured claim. As a result, WaMu employees with such compensation might be out of their money." - Seattle Times, "WaMu sale could mean job cuts - and maybe hires, too. JPMorgan will make a $1.9 billion payment to the FDIC as part of the acquisition, which makes the company the biggest U.S. bank by deposits. This gives them all of WaMu's deposits and branches. JPMorgan won't acquire WaMu's liabilities, including claims by shareholders and subordinated and senior debt holders, the FDIC has said. JPMorgan is taking on $176 billion in mortgage-related assets and writing down the value of it and other portfolios by about $31 million. In other words, they are writing off about $31 million in bad loans. JP Morgan Chse expects it will trim 15% of combined operating expenses. The extent of job cuts aren't yet know, Charles Scharf, CEO of JPMorgan's retail bank, said today on a call with reporters. The bank plans to consolidate about 10 percent of the overlapping branches in locations including Illinois, Texas and New York. Branches will be added in California, Washington and Florida, among other states, and will have 5,400 offices with about $900 billion in deposits. The branches and credit cards will carry the Chase brand and will be integrated by 2010, JPMorgan said. WaMu was known for its no-thrills, no-fees, unconventional banking with a hip, modern, neighborly feel. JPMorgan Chase, is known for being big and conservative. Its advertising preaches value and security. So which is better? Modern and hip, or old and conventional? For now, the WaMu signs will stay up, but within two years all remnants of Washington Mutual will be gone. Customers can call a Washington Mutual banking representative at 1.800.788.7000 or the FDIC Call Center at 1.877.275.3342 with questions. It has been reported however, that the WaMu customer service line does not offer access to any person. Computerized access to accounts for balance and transaction inquiries are still possible, but nothing beyond that. If you had a WaMu account, you now have an account with JPMorgan Chase Bank. All deposit accounts, including savings, checking, money market and retirement accounts and certificates of deposit, have been transferred to JPMorgan Chase Bank. No depositor has lost any money, even it it was above FDIC insurance limits. Direct deposits and Social Security checks will continue as normal. Your debit card and bill-paying services will continue to work. You can still use the checks you have now, and checks already written that did not clear before the institution closed will be honored if there are sufficient funds in the account. Local branches will be open as usual. All WaMu loans have been assumed by JPMorgan Chase Bank. Payment amounts and due dates will not change, and automatic payments will still work. Customers should continue to make checks out to Washington Mutual Bank. Interest on deposits accrued through September 25, 2008, will be paid at the previously stated rate. JPMorgan Chase Bank will be reviewing rates and will provide customers with information at a later date. Fishman, who has been on the job for less than three weeks, is entitled to around $11.6 million in severance and can keep his $7.5 million signing bonus. As of today, Fishman still retains his position as CEO of WaMu, according to JPMorgan Chase. Fishman serves as the chief executive officer of WaMu. Until 2007, he was president and chief operating officer of Sovereign Bank. He joined Sovereign through its 2006 acquisition of Independence Community Bank, where he had been president and chief executive officer since 2001. He held a variety of senior executive positions at Chemical Bank, a JPMorgan Chase predecessor and A.I.G. prior to Independence Community Bank. From 1999 to 2000 he was CEO of ContiFinancial Corporation. As with most bank takeovers, WaMu senior executives could be expected to be replaced by employees of JPMorgan Chase & Co. Profiles of the rest of WaMu's execs. In March, 2008, on the same weekend that Dimon of JPMorgan Chase negotiated his daring takeover of Bear Stearns, he secretly dispatched members of his team to Seattle to meet with WaMu executives. When JPMorgan Chase offered WaMu $8 a shore, largely in stock, the prior CEO, Killinger, balked at the deal and rejected it. If you owned stocks in WaMu, they are worthless. Stockholders and investors are basically wiped out. The U.S. Government saved the FDIC billions by taking over WaMu and selling it. And the CEO of WaMu is set to take off with a $7.5 million sign-on bonus, and a $11.6 million cash severance package. The U.S. Government meanwhile, made $1.9 billion dollars for simply saying "WaMu, you're ours now, and we just sold you to JPMorgan." So the government earns $1.9 billion dollars, while the shareholders/stockholder loose everything just to save the FDIC from spending money doing what they were invented for, and where some of your tax paying money goes. Meanwhile, Alan Fishman walks away with more than $13 million in severance and bonus pay. Oh an JP Morgan's stock rose about $5.00 a share today from $43.46 to $48.24, up 11%. Have I missed anything? WaMu is the latest casualty of a financial crisis that drove Lehman Brothers Holdings Inc. and IndyMac Bancorp out of business and led to the hastily arranged rescues of Merrill Lynch & Co. by Bank of America Corp. and Bear Stearns Cos., which was also absorbed by JP Morgan. Those companies were all too big to fail to begin with... now they're mega banks. And then there is the governmental emergency measures to stabilize Goldman Sachs, Morgan Stanley and the American International Group. In 2005 there were 0 bank failures. In 2006 there were 0 bank failures. In 2007 there were 7 bank failures. So far in 2008, there have now been 13 bank failures. Bloomberg quotes Risk Analytics Managing Director Christopher Walen, who forecasts that approximately 100 banks with assets of over $800 billion could fail by the end of 2009. Wachovia has just announced they are now looking for a buyer. ...... Misery Index, who is now making a map where I have buried my cash in a bottle under a tree as I'd rather have what little money I have, than give it to a bank or investment company hoping to make $$ only to find out that I lose everything, with CEO's walking away with my hard earned cash. 0 Responses to "Another One Bites The Dust..... Good Bye WaMu."